In light of the amount of textiles needed to properly outfit them, beds are among the expensive pieces of furniture inventoried in elite colonial households. Historically, a distinction was made between the bedstead, or bed frame, and the bed itself, or mattress. High poster bedsteads or beds with curtain rods fixed to the ceiling offered their occupants privacy in addition to warmth. Some, like the lit à la duchesse, were permanent installations within a bedchamber. 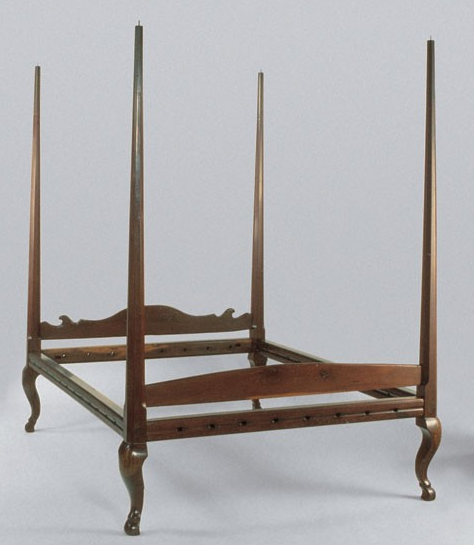 Others, like the lit en tombeau, or slope bedstead, could be disassembled and moved about a home as needed. In a large household like that of the governor-general, this practical sort of bed was commonplace; the 1726 inventory of Philippe de Rigaud, marquis de Vaudreuil, records eight such beds in his official Québec residence, the château Saint-Louis. When Louise d'Ailleboust d'Argenteuil, the widow of a prominent military officer, died in 1747, her estate included a lit en tombeau hung with green serge. The four-poster bedstead, a detail of which is left and a full view at the bottom of the page, is currently exhibited in the master bedchamber of the manoir Mauvide-Genest in Saint-Jean-de-l'Île-d'Orléans, on the Île d'Orléans upriver from Québec. It is of a more rectangular shape compared to the "sloping" canopy of the lit en tombeau, seen below left. Other bedsteads might come equipped with domed canopies. The 1743 Québec inventory of Marie-Anne Sarrazin, the widow of the famous colonial surgeon and scientist Michel Sarrazin, describes a lit à duchesse valued at 120 livres. This style of bed featured a canopy that extended from the headboard without any visible suspension for support, such as that seen above right. Although the cherry bedframe and mattresses were not in very good condition, the other parts of the bed increased its value. The bed's curtains, canopy, and coverlet were of green damask curtains, and the side curtains featured a coordinating fringe. Further afield on Bayou Teche, Etienne Martin de Vaugine de Nuisement slept on a walnut bedstead with pied de biche or hoof feet furnished with a bed tick, two cotton beds, a feather bed, a feather-filled bolster and pillow, two bedsheets, a tester, calico head curtain and counterpane, serge curtains, and a lawn mosquito net. A former French military officer who was given a Spanish commission after the colony's transfer to Spain, Vaugine had his plantation inventoried in 1773. Although made in coastal North Carolina, the mahogany bedstead at right is a rare survival and provides a useful comparison to the beds described in the Louisiana inventories. Ropes would have been strung through the rails, forming a surface upon which to rest the mattress, or lit. Coincidentally, the geographic area in which this bedstead was likely made boasted a sizeable community of French Huguenot immigrants by the early eighteenth century. In form it is perhaps similar to Vaugine's pied de biche bedstead inventoried in the early 1770s. In Louisiana, Saint-Domingue, and the Lesser Antilles, beds were often equipped with mosquito netting to guard against bites and their accompanying discomfort. Although he died in England after being taken prisoner by the British in 1758, the possessions of François Goudeau, the king's surgeon in New Orleans, were inventoried in 1759. These included two bedsteads, one of cypress and one of mahogany, both of which were outfitted with silk mosquito bars. The inventory indicates that the mahogany bedstead was used by Goudeau's widowed mother-in-law, the innkeeper Élisabeth Real Pascal Marin. Located just outside the city, the plantation home of Jean-Baptiste Prévost, the former agent of the French East India Company, contained a number of calico, gauze, lawn, and linen mosquito nets when he died in 1769. These were held in place over beds with rods and rings, but could also be suspended from the ceiling.